In this blog your will find information that has helped us, and we would like to share this knowledge with you. I have always had an avid interest in health, nutrition and exercise! Many in my family died of heart disease and when I finally understood the superiority of a plant-based diet as taught by God in Genesis 1:29, I felt like I had discovered what God had in mind for our bodies from the beginning and will have for us again when we live with Him forever in the New Jerusalem. I wished I had discovered this life changing and life saving information much earlier in life, but now that I have this information, I want to help and share what I have learned and personally experienced with others. Sadly, when I have tried to share this information, people do not want to hear it. I care about others and want desperately to help them. I find that talking to people in general about a changed diet is much like trying to talk to a lost person about Christ – most are not interested in hearing about it and want to continue doing it their own way. It is sad to see and read about so many sick and dying with cancer and many other illnesses when these infirmities could have been prevented if people would only have eaten a healthy diet. This life is “but a vapor” as the Bible states, and God wants us to live it to its fullest and not just survive day after day, as we share His love with others. God said: ‘My people are destroyed for lack of knowledge.’ His word also tells us that some are to be teachers and my desire is to teach others that they too can live a healthy life. The devil wants us to stay ignorant, but Jesus said: “You shall know the truth and the truth shall set you free.” He also told us that we should love our neighbor, and how better can we show love to our neighbor than by affirming to them the good news that they don’t have to be sick and then showing them the way to health. This good news is a hidden truth that needs to be heralded to the world and by God’s grace I will share it to as many people as I can! 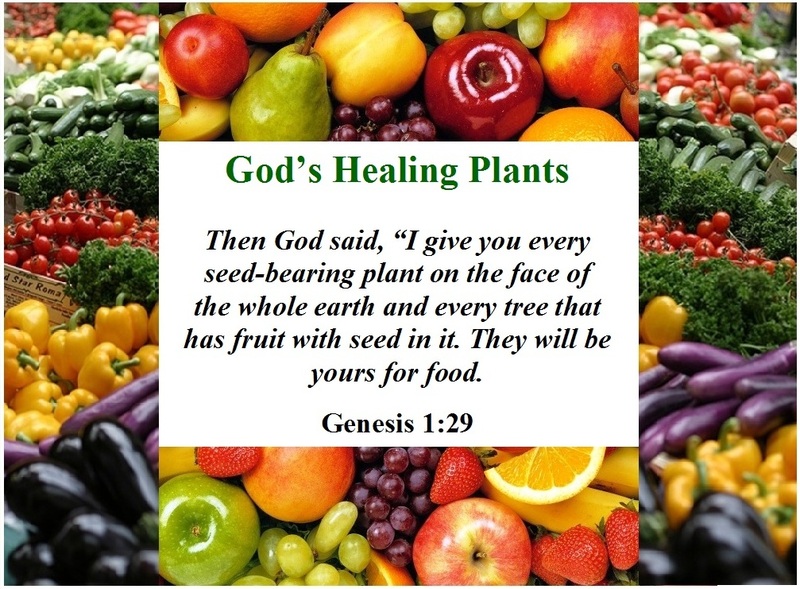 The nutrition and health information presented at the God’s Healing Plants Website is based on Scripture, research and personal experience, and is offered for educational purposes only. There can be risks involved when changing diet and lifestyle; therefore, as each guest chooses to make these types of changes, God’s Healing Plants Web Site, cannot be held responsible or liable for any adverse effects or consequences that may result from your personal choices. Nice work. I was trying to find the list you had done a couple years ago and its somewhere in my mountain of old e-mails I have saved. I was so glad to see your site with all the information. Give thanks! Was Yeshua(Jesus) a vegan Nazarite? I don’t think so the Bible tells us that He ate fish. But I am thankful that He created all the wonderful fruits and vegetables for us to eat. I so believe in the power of eating good, natural food. I’m really enjoying your blog – food for thought! Hello. I just read your “about” page and wanted to say, Keep going in God. You’re doing something wonderful, that is vitally important. Regardless of opposition or difficulty, you are following hard after truth, and that is always commendable. Our Lord has created many things to keep us operating at our best, and the more we know, the healthier and wiser we will be, and better equipped to live out our purpose on earth. The Word tells us in Eph. 4:15 to speak the Truth in Love, and even tells us what that looks like in 1 Cor. 13:4-8a. That is what you’re doing. Bless you for your diligence and perseverance. Keep it up. You are needed and appreciated. Thank you Abigail for your kind comments. All honor and glory goes to our Lord who created these beautiful fruits, vegetables, nuts, seeds and herbs for us to enjoy. Blessings. God has so many wonderful foods that He created for us. So glad we are like minded. Blessings. Thank you for your efforts and support of a plant-based diet/lifestyle. I believe this is the one thing that can truly fight world hunger and save the world. I am not 100% plant-based but I am an aspiring vegan and working towards that goal. I am following you and look forward to your posts! Beautiful and educative web, God bless you. Thank you. God bless you also. Thank you Lyndell for your kind comments. Blessings to you as well. Hello! I am new as of today July 20th, 2018. I am older and have been working on losing weight, but find that I still crave carbs and sugar. We actually have two bee hives and just read about the benefits of eating and using honey. I had no idea about the many advantages. I am gravitating towards eating less meat and really don’t like maltreatment of animals. Anyway looks like there is a wealth of information here.. So glad you found the article helpful and that you are on your way to healthy eating. We will keep you in our prayers trusting in Him to give you wisdom. Blessings. Thank you, I appreciate your response..